The Microelectronics Packaging & Test Engineering Council (MEPTEC) began over 30 years ago, and provides a forum for semiconductor packaging and test professionals to learn and exchange ideas related to packaging, assembly, and test. Monthly luncheons, symposiums, and an Advisory Board allow MEPTEC to continuously strive to improve and elevate the roles of assembly and test professionals in the industry. 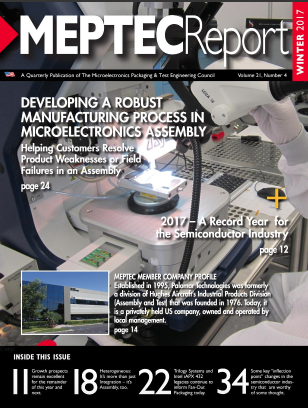 Each quarter, MEPTEC publishes the MEPTEC Report, featuring articles on cutting edge technology, guest editorials, industry developments, and other news applicable to major issues surrounding the world of semiconductor assembly and test. The Winter 2017 issue features a profile on Palomar Technologies and SST Vacuum Reflow Systems. You can check out the publication and full article here: https://issuu.com/mepcom/docs/meptec_report_winter_2017.